Some numbers are overloaded; others have only a couple of applicants -- and most players wear more than one number during their careers. In trying to determine the best of the best, we've attempted to limit players to the number they wore the most, or the one they're known most for wearing. Given those parameters, here's a look at the best of the best of NHL players who have worn Nos. 67 to 99. For the best to wear Nos. 00 to 33, click here; for the best to wear Nos. 34 to 66, click here. Of the 11 players who have worn No. 67, the best has been Frolik, Florida's first-round pick (No. 10) in the 2006 Entry Draft. The Czech native made the Panthers as a 20-year-old and has put up back-to-back 21-goal seasons despite averaging just 16:10 in ice time in 161 games. The Penguins' consolation prize for missing the 1990 Stanley Cup Playoffs on the final day of the season turned out to be Jagr, who stepped right in that fall and played a key supporting role on the Penguins' first Stanley Cup team. He went on to win five scoring titles, the Hart Trophy as MVP in 1998-99, make the First All-Star Team seven times and leave the NHL with 646 goals and 1,599 points in 1,273 games. He's the highest-scoring European-born player in League history. Angelstad, a career minor-leaguer, was 32 when the Washington Capitals called him up for two games in 2003-04. He's the only NHL player to wear this number. Tverdovsky wore No. 70 for only one season, with Carolina in 2005-06. But it turned out to be a lucky number -- in that one season, the Hurricanes won the Stanley Cup. Tverdovsky also earned a ring as No. 10 on the 2003 New Jersey Devils. He's the second-best player on his own team and (arguably) the second-best Russian player in the NHL. Malkin, who turned 24 this summer, already owns a scoring title, a Stanley Cup ring and a Conn Smythe Trophy, as well as 381 points in 309 NHL games -- and he's still just scratching the surface of what he can do. A productive offensive defenseman for a very long time, Schneider wore No. 72 in the 1990s for Montreal, the Islanders and Toronto -- one of 11 different uniform numbers he's worn during a career that's lasted 21 seasons. Of the seven players who have worn No. 73, Ryder is by far the most accomplished. He was a two-time 30-goal scorer with Montreal and has had 27 and 18 goals in two seasons with Boston, giving him 144 in 470 NHL games during his six-year career. McKee has worn No. 74 for almost all of his career -- most of which has been spent blocking shots and doing everything else possible to keep the puck out of his own net. He has just 21 goals in 802 NHL games, but usually has been among the NHL's best shot-blockers. Poddubny wore No. 75 in his one season with the Quebec Nordiques (1988-89), during which he put up 38 goals and 75 points. That earned him a trade to New Jersey, where he spent his final three NHL seasons as a part-time player. Peters is the only player to see any extensive NHL playing time while wearing No. 76, which he did for four seasons with the Buffalo Sabres. Montreal rookie P.K. Subban (14) has more playoff appearances than any other No. 76. Bourque started his career in Boston wearing No. 7, but changed to No. 77 on one of the most memorable nights in the history of the old Boston Garden -- he peeled off No. 7 and handed it to Phil Esposito, revealing the new jersey underneath. Bourque was a great player from the moment he stepped onto the ice in 1979 to the day he retired as (finally) a Stanley Cup champion in 2001. Pavol Demitra wore No. 78 during his time in Ottawa before blossoming in St. Louis. Pouliot, Edmonton's first-round pick in 2003, has 21 goals in 176 NHL games and is the best of the five players who've worn this number. Markov is the only one of the three players who have worn No. 79 to do it for his entire career. The 31-year-old has emerged as one of the NHL's best defensemen, putting up 80 goals and 363 points in 616 games during nine seasons with the Montreal Canadiens -- a pretty good return from a sixth-round pick. Antropov, who has worn No. 80 with Toronto, the Rangers and now with Atlanta, appears to be getting better as he gets older. The 30-year-old is coming off a career-best 67-point season, and has been a 20-goal scorer in each of the last three seasons. Satan, who showed during last spring's playoffs that he still has some scoring touch, is by far the highest-scoring player ever to wear No. 81. 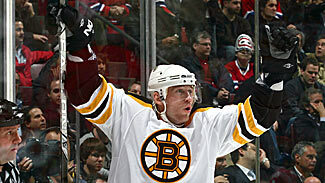 He has 363 goals in 1,050 games, most recently with Boston, and has 10 seasons with 20 or more goals. He's the only player ever to wear only No. 82 in a career of any length. Straka had a pair of 30-goal seasons with Pittsburgh and a pair of 70-point seasons playing on Jaromir Jagr's line with the Rangers, leaving the NHL with 257 goals and 717 points in 954 games. When Latendresse was given No. 84 by Montreal in 2007, he became the first player in NHL history to wear the last unused double-digit number in League history. After three seasons of 16, 16 and 14 goals, he was dealt to Minnesota last season, flipped the digits of his uniform to No. 48 -- and scored 25 goals in 55 games. The first No. 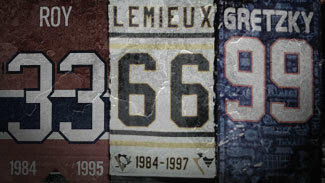 85 in NHL history remains the best. Klima started his career with three 30-goal seasons for Detroit, scored the triple-overtime winner for Edmonton in Game 1 of the 1990 Stanley Cup Final, reached the 40-goal mark in 1990-91, and finished his career with 313 goals in 786 games. Wolski became the best No. 86 ever almost by default when he put it on after being dealt to Phoenix at the trade deadline in March: The only previous wearer was Jonathan Ferland, who played seven games for Montreal in 2005-06. Wolski, who wore No. 8 in Colorado, was a point-a-game player in his new number with the Coyotes. 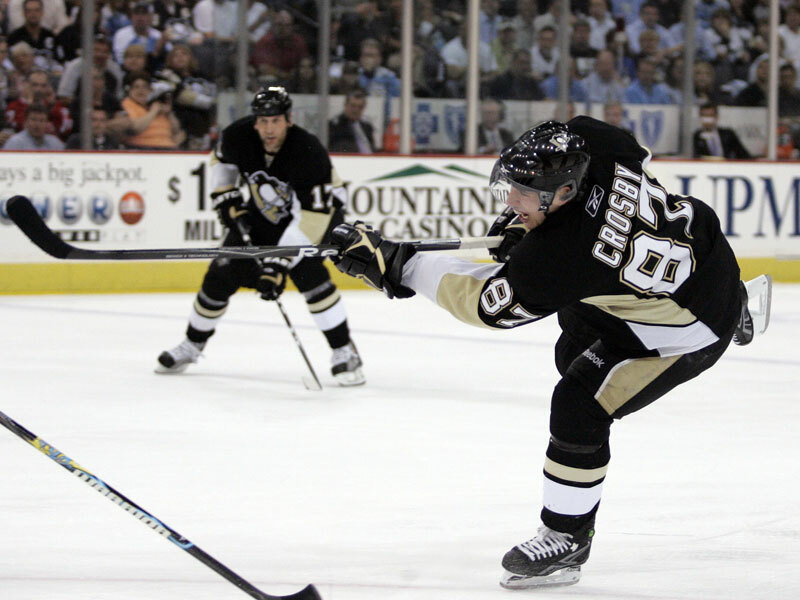 Perhaps the most amazing thing about Crosby is that he's been as good as, if not better, than he was touted to be. He already has a Stanley Cup ring (as the youngest captain in NHL history), a scoring title, an MVP award -- and he just turned 23. He may or may not break Wayne Gretzky's scoring records, as Gretzky once said he might, but Crosby is everything the Pittsburgh Penguins could have asked for when they won the lottery to draft him No. 1 in 2005. 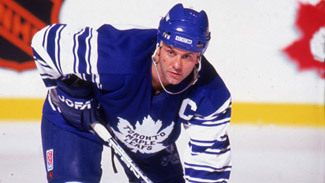 Controversy and injuries dogged Lindros from the day he was drafted No. 1 in 1991 -- he wouldn't go to Quebec, two teams thought they'd traded for him a year later, and he wound up retiring young because of a series of concussions. But he did put up 372 goals and 865 points in 760 games, won an MVP award and helped the Flyers dig out of their early 1990s malaise to make the 1997 Stanley Cup Final. Mogilny's defection from the Soviet Union in 1989 was one of the events that helped pave the way for a deal that allowed Soviet players to play in the NHL. He finished with 473 goals in just 990 games and had some seasons for the ages -- most notably a 76-goal, 127-point performance for Buffalo in 1992-93, 55 goals and 107 points with Vancouver three seasons later and a 43-goal effort with New Jersey in 2000-01 after helping the Devils win the Cup the previous spring. Juneau, a college star at RPI, started his career with a bang -- he had 32 goals and 102 points for Boston in 1992-93, his second NHL season. He never came close to those numbers again, but finished with 156 goals and 572 points in 828 games. Juneau is one of only three players to wear No. 90 (Mike Modano will be the fourth with Detroit this season), and the only one to do so for more than one season. Like Mogilny, his linemate in Russia, he defected to North America and became a star. Fedorov could score (he went 56-64-120 in 1993-94, when he won the Hart Trophy), but he was more than just a one-way player -- he won the Selke Trophy twice, including in his 120-point season. Fedorov was part of three Cup-winners in Detroit and mentored Alex Ovechkin for a couple of seasons in Washington before leaving the NHL with 483 goals and 1,179 points in 1,248 games. Nylander wore No. 92 for most of an NHL career that saw him total 209 goals and 679 points in 920 games. His best seasons came in his early 30s, when he put up 79 and 83 points with the Rangers while centering a line that included Jaromir Jagr and Martin Straka. Gilmour switched from No. 39 to No. 93 when he was dealt to Toronto from Calgary in January 1992 -- and promptly put up back-to-back seasons of 127 and 111 points in his first two full seasons with the Leafs. He never matched those numbers again, but was among the NHL's most intense players for another decade before retiring with 450 goals and 1,414 points in 1,474 games. Smyth has worn his draft year since breaking into the NHL with Edmonton -- and he's spent 15 seasons making life as miserable as possible for opposing goaltenders. He's never matched the 39 goals he scored in 1996-97, his first full NHL season, but he's connected for 332 goals -- most of them scored from right in front of the net. Pittsburgh took Morozov in the first round of the 1995 Entry Draft and had him in the NHL in 1997 at age 20. His talent was apparent from the start, but despite scoring 20 goals in 2001-02 and 50 points in 2003-04 at age 26, he went back to Russia during the work stoppage and has opted to stay there. Morozov is one of only five players to wear No. 95, and the only one to do so in more than one season. Two players with far better career numbers than Holmstrom -- Pavel Bure (three seasons) and Phil Housley (one) -- both had encounters with No. 96. But no one who's worn it full-time has ever been better than Holmstrom, who has earned each and every one of the 214 goals he's scored by getting in the face of opposing goaltenders. He's got the bruises to prove it, though his four Stanley Cup rings are plenty of consolation. Roenick never was the offensive force wearing No. 97 that he'd been wearing No. 27 -- the number he sported for his first eight NHL seasons with Chicago. He made the switch after being dealt to Phoenix in 1996 and kept it through stints with Philadelphia and Los Angeles before going back to No. 27 in his last two seasons with San Jose. He never was a 50-goal man in his new number, but Roenick did have seven consecutive 20-goal seasons wearing it. Lawton, the first U.S. high school player ever taken with the No. 1 pick in the draft, wore No. 98 for his first two seasons with the Minnesota North Stars before downsizing to No. 8. The change helped his game -- he went from 5 goals to scoring 18, 21 and 17 in the next three seasons. But that was as good as it got for Lawton, whose NHL playing career ended at age 27 -- though he's gone on to be an agent and general manager. He's the only player to wear No. 98. There actually have been three other players (Wilf Paiement and Rick Dudley in the early 1980s, and Joe Lamb with the Montreal Canadiens in the 1930s) who also wore No. 99. But Gretzky, who idolized Gordie Howe but couldn't get No. 9 when he started playing junior hockey because a teammate had it, has turned No. 99 into the most recognizable number in hockey. No player in hockey, and maybe in any sport, is as identified with a number as Gretzky is with No. 99 -- and with his number retired throughout the League, The Great One and the NHL's last two-digit number figure to stay that way for a long time.